Wireless home security outdoor camera kits can provide you with the peace and comfort of security while providing the ease of do-it-your-self installation. Not only are wireless home security outdoor camera kits easy to install, but they are affordably priced and easy to use as well. Typical wireless home security outdoor camera kits contain all the components you need to set up your own residential security/surveillance system. They include the wireless security camera(s) and power supply, receiver, processor, and digital video receiver or DVR and/or software and hardware that can enable you to use your personal computer instead of the DVR. Security cameras require a power source and a method of transmitting their images. This is normally done by wiring the camera with a power source which is provided in the kit, or by a rechargeable battery. The method of transmitting the images is by cabling coaxial cable from each camera to the processor or DVR. Wireless home security outdoor camera kits contain wireless cameras; that is, the cameras do not require the coaxial transmission cable. Instead, wireless cameras transmit their signals through an antenna to a receiver. This eliminates the need to run a coaxial cable from each camera to the processor, personal computer or DVR unit. Most wireless home security outdoor camera kits utilize the 2.8 or 5.8 GHz radio band to transmit their images to a receiver. Wireless security cameras can transmit on several different channels and one receiver can receive up to 4 different channels. Their maximum range is approximately 700 feet line-of-sight. Line of sight means the ideal transmission route where nothing blocks the sight between the transmitting camera and the receiver. When objects are between the two, wireless security cameras still have a range of approximately 300 feet, depending on the environment. In addition, these wireless cameras are rated for outdoor use. They may have an IP rating, which stands for ingress Protection. This is an International Electrical standard code that describes the amount of protection the camera unit has to external elements. Most wireless outdoor cameras will have an IP rating of IP66 or IP67 which means they are completely sealed and protected from the harmful effects of dry matter as small as dust and water sprayed as strong jets or when being submerged up to one meter in depth. Wireless camera systems must have a corresponding wireless receiver to which the wireless cameras’ data is sent. The receiver is much like the base unit of a residential wireless telephone. However after it received the signal from the wireless cameras, it passes the digital information along to a processor, capture board, or your personal computer. Here the signals are usually reduced in size using CODEC (COmpression DECompression) software or hardware. This process reduces the size of the digital file so that it can be easily handled by the processor and stored on some type of digital media. Digital video files can be extremely large such that without this process even the largest capacity storage drives can be filled to maximum very quickly. Next the processed digital file is stored on a digital video recorder or DVR. A DVR is a magnetic storage disk just like the hard disk drive in a personal computer. In fact, with the proper software installed, a personal computer can be used to process and store the digital file instead. At some point, the DVR or computer hard drive will reach its maximum storage capacity. When this happens, the DVR or computer hard drive is instructed to begin re-recording over the data it originally saved first. If segments of this data require archiving or copying to provide to police departments for example, recorded material can usually be copied on a USB flash drive or an internal or external DVD writer. 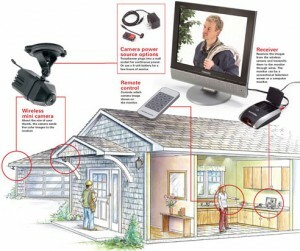 Wireless home security outdoor camera kits have many applications about the home. They can be used to provide general security about the perimeter of the property, both day and night. They are useful for providing security and monitoring of driveways, garage or barn areas, and large, open yards. Tests have shown that just the known presence of a security camera can deter or diminish vandalism and theft. So don’t hesitate to discuss with our digital security experts about the different types of wireless home security outdoor camera kits and determine which would best suit your needs.